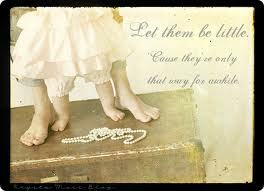 With a mile long to-do list and shoes in the hallway, I’m reminded to “let them be little”. My youngest has started coming into my room in the middle of the night, I used to try to take her back to her room, but the crying would get so loud that it would wake my oldest. So, now I lift her up into my bed and sometimes don’t even remember doing so. I wake up to a sideways, almost three year old most mornings. And, I’m ok with it. I have started to treasure it and realize how one day I’ll truly miss it. That last sentence brought tears to my eyes. Little ones are exhausting. We don’t sleep as well after kids. Our houses aren’t nearly or consistently as clean as before kids. Our choices and priorities change. Our eyes and hearts are opened to new loves and new fears like we never experienced before kids. We relate to other parents. We also realize how little we CAN control in their lives and how desperately we need God’s guidance, direction, and protection. Thank you, Lord, for the gift of these children you’ve blessed us with. We ask your blessings be poured out over them. Open their eyes and hearts to You. Surround them with people who will point them to You. Protect them from evil. Comfort and strengthen us parents as they make personal choices for their lives and spread their wings. Help us look to you when the sting of separation is too much to bare. Thank You for the little one who comes to my bed at night and thank You for reminding me to let them be little. Time is precious. So true Darla. Love your insight and that you can share it!! I am being blessed. Thank you Sheila. What a blessing!